Money saver for your gas budget. Affordable purchase! Drives excellent. This car gets awesome gas miles! Which is amazing for a struggling single mom that only has to put about 20 dollars in for a full tank of gas and drive for about a week and 1/2 before I have to fill up again. The price of the vehicle because it's obviously a 2006 and older, is very affordable and I paid about 6, 000 in cash. It drives very well but it is a very light car. I do dislike when I get into the vehicle it sits so low it feels like you are plopping down into the seat and it's sometimes hard getting a toddler out of off. It has 4 doors and a pretty good size trunk. This was a used car so it has a new engine because I guess the engine was recalled and the previous owner had it fixed when he received the recall notices. Over all I love the car because it drives so efficiently. My number one concern is saving money and this car is the key to saving money on transportation! I love it. Cheap car, but very well holding! I think Honda are really good cars. I have heard that when I was a kid and now that I am grown, well I cannot help but agree. My car is a 2006 Honda Civic hybrid with almost 200k miles. I barely go to the mechanics unless it is for oil change or just some checking. I mean this baby knows how to speed, and the brakes are fine. I have been able to do a road trip with that car from Omaha to Mankato with no issue even though I needed some alignment on my tires. I have gone through the last winter with just a few problems. For someone like me that does not go to the mechanics very often I think this car is holding pretty well. My Honda had been the most reliable car I've had yet! As long as you get an oil change and keep up with maintenance it runs smoothly and without issues other than typical wear and tear. 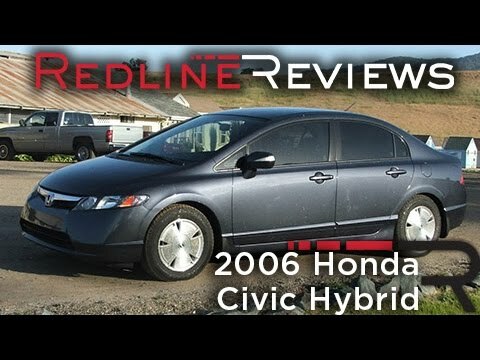 As far as cosmetics, I've noticed Honda civics made after 2000 tend to have bumper painting start to chip and it looks awful and/or dates your car. Also, the visor tends to be an issue and doesn't hold well in really hot weather like here in Texas. It's as if the equipment used melts and the visor won't stay up or in place. Can also be an issue when tall or bigger people try to get in your car, valet always complains. ON CERTAIN COMPRESSED NATURAL GAS (CNG) VEHICLES, IN THE EVENT OF A SEVERE INTERIOR FIRE IN THE AREA OF THE REAR SEAT, THE CNG TANK MAY BE HEATED UNEVENLY, PREVENTING THE PRESSURE RELIEF DEVICE FROM VENTING THE CONTENTS OF THE TANK AS DESIGNED. THIS COULD RESULT IN A TANK RUPTURE, EXPLOSION, AND EJECTION OF THE TANK FROM THE VEHICLE. DEALERS WILL INSTALL A HEAT INSULATOR MATERIAL TO THE REAR SEAT BACK. AN INTERIM OWNER LETTER WILL BE MAILED DURING NOVEMBER 2007. WHEN PARTS ARE AVAILABLE, OWNERS WILL BE RENOTIFIED ASKING THEM TO BRING IN THEIR VEHICLE FOR REPAIR. OWNERS MAY CONTACT HONDA AT 1-800-999-1009. ON CERTAIN 2-DOOR PASSENGER VEHICLES, THE REAR WINDSHIELD OR REAR QUARTER GLASS PANELS DO NOT PROPERLY ADHERE TO THE BODY OF THE CAR DUE TO IMPROPER WINDOW OPENING PREPARATION. THE REAR WINDSHIELD OR REAR QUARTER GLASS PANELS MAY BECOME LOOSE, RATTLE OR LIFT FROM THE WINDOW OPENING OR SEPARATE FROM THE WINDOW WHILE DRIVING INCREASING THE SAFETY HAZARD TO TRAFFIC. DEALERS WILL REPAIR THE VEHICLE BY REMOVING THE GLASS, PROPERLY PREPARING THE WINDOW OPENING, AND REINSTALLING THE GLASS. THE RECALL IS EXPECTED TO BEGIN DURING LATE SEPTEMBER 2006. OWNERS MAY CONTACT HONDA AT 1-800-999-1009. ON CERTAIN VEHICLES, THE WHEEL SPEED SENSOR HOUSING USES AN O-RING SEAL TO PREVENT LEAKAGE TO OR FROM THE WHEEL BEARING. IF ASSEMBLED IMPROPERLY, THE O-RING MAY NOT SEAL PROPERLY ALLOWING WATER TO ENTER THE WHEEL BEARING AND EVENTUALLY CAUSE DAMAGE TO THE BEARING, ESPECIALLY IN AREAS WHERE USE OF ROAD SALT IS PREVALENT. IF THE DRIVER CONTINUES TO DRIVE WITH THIS CONDITION IT IS POSSIBLE FOR THE WHEEL BEARING TO BECOME LOOSE, WHICH COULD CAUSE THE BEARING TO FAIL. THIS COULD CAUSE A WHEEL TO FALL OFF OF THE VEHICLE, POSSIBLY RESULTING IN A CRASH. DEALERS WILL INSPECT THE REAR ABS SENSORS AND WHEEL BEARINGS FOR DAMAGED PARTS AND REPLACE THEM FREE OF CHARGE. THE RECALL IS EXPECTED TO BEGIN ON OR ABOUT SEPTEMBER 17, 2007. OWNERS MAY CONTACT HONDA AT 1-800-999-1009. ON CERTAIN SEDAN AND HYBRID VEHICLES, DURING ASSEMBLY, THE TELESCOPIC STEERING COLUMN MECHANISM MAY HAE BEEN OVER-LUBRICATED WITH SILICONE GREASE. OVER TIME, SOME OF THIS EXTRA GREASE MAY DRIP ON THE BRAKE LIGHT SWITCH AND THE SWITCH MAY FAIL. FAILURE MAY RESULT IN A LOSS OF BRAKE LIGHTS AND AN INCREASED RISK THAT THE VEHICLE COULD BE STRUCK FROM THE REAR. IN ADDITION, A FAILED BRAKE LIGHT SWITCH COULD PREVENT SHIFTING THE TRANSMISSION FROM THE PARK POSITION (VEHICLES WITH AN AUTOMATIC TRANSMISSION). DEALERS WILL REPLACE THE BRAKE LIGHT SWITCH AND INSTALL A PROTECTIVE COVER OVERTHE SWITCH FREE OF CHARGE. THE RECALL IS EXPECTED TO BEGIN ON OR ABOUT SEPTEMBER 27, 2007. OWNERS MAY CONTACT HONDA AT 1-800-999-1009.